Enter now for free giveaways worth up to $44,000! Keysight is launching Wave 2018, a first-of-its kind event created to connect you with our experts! Join us March 1-16 to learn helpful tips, discuss the latest ideas, and explore new advances in the industry via daily videos, exclusive content, and live Q&As. Plus, you can register for daily bench and RF giveaways worth up to $44,000! You won’t want to miss a minute of this event – or your chance to win. You can register now for a free early entry, and mark your calendar for March 1 when we’ll kick off Wave 2018 with a live stream. Get ready to discover an entire Keysight community focused on helping you become an engineering legend! Enter Keysight’s Test to Impress contest during Wave 2018 for even more ways to win. Simply submit a short video on why you need test and measurement equipment, and our panel of judges will be awarding one grand prize winner, who will get a bench or RF bundle prize of their choice, and four runner-up winners, who will get a DSOX1102G InfiniiVision 1000 X-Series oscilloscope. Want to see example entries? Check out the 2017 Test to Impress entries playlist. What happened to Scope Month? Wave 2018 is the next evolution of Keysight’s Scope Month, a 2016/2017 month-long oscilloscope-focused event that also featured measurement tips and giveaways. During Wave 2018 you’ll have access to helpful content beyond just oscilloscopes. Learn tips and tricks that will help you master all of the test and measurement tools on your bench. Scope Month had drawings for single oscilloscopes, but during Wave 2018 you could win giveaway bundles that include oscilloscopes, waveform generators, power supplies, digital multimeters, microwave analyzers, and more! Keysight Bench Facebook Page – Don’t miss out on information about Wave 2018 and other events by following us on social. Keysight Lab’s YouTube Channel – Get a steady stream of how-to videos by subscribing to our YouTube channel. “EEs Talk Tech” Electrical Engineering Podcast – Join Mike and Daniel as they cover a broad range of topics from the basics of electrical engineering to the tough engineering problems of tomorrow’s technologies. Keysight Oscilloscopes Blog – Follow for the latest industry news, measurement tips and advice from Keysight oscilloscope experts. Keysight General Electronics Measurement Blog – Follow for more information about Keysight solutions, new applications, measurement tips, and industry trends. Keysight RF Test Blog – Follow to learn how to improve your RF test measurements. Modular Oscilloscope or Digitizer for Wideband Measurements? There are many similarities and differences between oscilloscopes and wideband digitizers. How do you know which is the right tool for your measurement need? For visualization purposes, an oscilloscope also has continuous waveform acquisitions in display memory. An oscilloscope can produce an extremely high waveform update rate > 1,000,000 waveforms per second. Shown below, with an oscilloscope’s high speed waveform update rate and its ability to pick up glitches or unexpected events. Many oscilloscopes have a wide range of automatic measurement capabilities like rise/fall time, delay, peak to peak, zone triggering, etc. In addition, with the wideband acquisition, oscilloscopes are also ideal for high speed digital test, emerging serial protocols, and advanced communications. With the wide bandwidth, vast measurement capabilities and robust user friendly interface, weather in bench or modular form factor, an oscilloscope is a general purpose tool that can be used for many applications. Keysight’s modular oscilloscopes, the M924xA series, range from 200 MHz to 1 GHz and feature the same functionality you would find on a benchtop oscilloscope. Digitizers are more purpose built. Their main goal is to capture many channels of data with high resolution to achieve the best measurement fidelity. 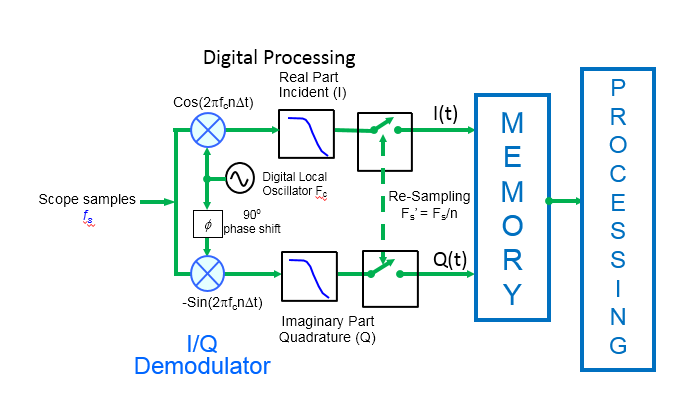 While oscilloscopes typically have 8- to 10-bit ADCs, a digitizer is usually 10- to 16-bits. This doesn’t tell the whole story though. There are other noise factors to consider such as ADC differential and integral nonlinearities, thermal and shot noise, input signal distortion, as well as sample aperture jitter and ADC sample clock noise. Therefore, a better measure of the resolution is the ENOB, or Effective Number of Bits. One technique digitizers use to get even more ENOBs is digital down conversion (DDC). DDC is extremely valuable when analyzing a small slice of spectrum within a wideband acquisition, allowing the user to reduce the bandwidth and ‘tune and zoom’ into a specific part of the signal. Here is the digitizer DDC block diagram. It’s common for oscilloscopes to provide extremely wide bandwidth while digitizers provide higher ENOBs over smaller bandwidths. In normal use a digitizer will acquire many channels of data over longer time periods, producing lots and lots of data. The data is either analyzed onboard or sent to a PC or storage device for post processing. For this reason, digitizers typically have deep memory buffers behind each ADC and very high data transfer rates. For on-board processing, it’s useful to access the digitizers internal FPGA to do some real-time signal processing. This allows the data processing and manipulation routines to reside in the hardware at GS/s processing rates and is useful for embedding algorithms to implement onboard custom filtering, correction routines, data reduction schemes as well as application specific routines. This provides very specific application needs at very high speeds. Here you can see a process for acquiring the data, processing, extraction, analysis and playback. A digitizer is always connected to a PC and is controlled through a computer soft front panel or an automated program. With this, there is less of a need for high-speed waveform update rate to the computer display. The purpose-built nature of a digitizer makes it more of a dedicated tool for specific applications. Webcast: "Oscilloscope or Digitizer for Wideband analysis - Why care?" . The S-Series oscilloscope (500 MHz to 8 GHz) has unmatched measurement accuracy with the best signal integrity and the most comprehensive measurement software for signal analysis, compliance, and protocol analysis. And now the Keysight S-Series oscilloscope just got better with a great offer allows you to tailor the product for your own needs for FREE. Want to show off your cool project? E-mail moreinfo@keysight.com and your project could be featured here! Quinton Martins, the leader of the Mountain Lion Project at the Audubon Canyon Ranch (ACR) in Northern California, had a problem. Mountain lions needed to be trapped and GPS-tagged for research, but traditional trapping methods were just not effective enough. The traditional technique for trapping mountain lions involves the use of a one-door “single- ended” cage, with bait to lure the cat inside. A mechanical pressure plate on the cage floor triggers the door-closing mechanism. There are two significant issues with this approach. Bait isn’t tempting enough. Where food is abundant, mountain lions may not be hungry enough to venture into a cage. It can also be very difficult to source mountain lion munchies, like roadkill deer. The wrong animals are caught! Often smaller animals like foxes and bobcats end up in the traps instead of mountain lions. Mountain lions commonly re-use the same walking paths, so Quinton is able to use bushes and sticks to ‘funnel’ the animal into a walk-through cage that is open at both ends. This works well because it is far easier to convince a mountain lion to walk into a cage if it can see a clear path through the other side. It also eliminates the need for bait by taking advantage of the mountain lion’s natural walking path. The challenge was to develop a reliable electronic system that would simultaneously close both doors of the walk-through cage while the mountain lion was inside. In this new design, the doors operate very simply. They are held vertically in “U” channel guides and drop when actuator rods are pulled (Fig. 1). A single, high-power solenoid pulls a wheel, which is connected to both actuator rods. The electrical system is controlled by an Arduino Uno microcontroller and a high current relay to activate the solenoid (Fig 2). The system needed to detect the motion of a mountain lion without trapping smaller animals. I investigated several options for sensing mechanisms including a horizontal light beam sensor and ultrasonic range sensors. The light beam sensor worked, but it was difficult to set up and align and involved hanging wires over the side of the cage. I ultimately decided to use less intrusive ultrasonic range sensors installed at the top of the cage. The system needed to detect the motion of a mountain lion without trapping smaller animals. By measuring the distance from the top of the cage to the animal, we could set it to trigger on large animals only (mountain lions are typically at least 20 inches tall at their shoulders). The system was designed with two range sensors spaced 14 inches apart that would trigger only when both sensors detected an object at least 20 inches tall. This double-sensor set-up minimizes the chance of triggering on a smaller animal, such as a fox, that might sniff the top of the cage with its nose. If that happens, the small animal would only trigger one of the sensors, so the doors would not close. The system was designed with two range sensors spaced 14 inches apart that would trigger only when both sensors detected an object at least 20 inches tall. With the basic design established, the next challenge was to write and debug the code controlling the actuator mechanism, which proved to be challenging. Incorrect timing caused the ultrasonic sensors to interfere with each other. We needed a way to debug the trap while in the field - the Keysight 1000 X-Series low cost oscilloscope proved to be just the right tool. The 2-channel oscilloscope allows the signals from both sensors to be viewed simultaneously, enabling us to adjust the timing and ensure reliable operation. We needed a way to debug in the field – the Keysight 1000 X-Series Oscilloscope proved to be just the right tool. Figure 3: Keysight EDUX1002A Oscilloscope being used to debug the actuator circuit. Mountain lions have very large territories, so patience is required when trapping these elusive animals. After about two weeks, the waiting paid off, and we trapped our first mountain lion with this system, a female, and then caught a male 2 days later! Neil Martin is Keysight’s Corporate Marketing Director. He used to be an R&D engineer and he can still remember a little engineering - which he makes use of in his spare time for volunteer projects. When you are testing a crystal oscillator circuit with an oscilloscope probe, the oscillator may stop oscillating or the waveform may be severely distorted. Why? Every probe functions as an external circuit connected to the device under test. Each probe has its own input resistance, capacitance and inductance, imposing additional load to the DUT. Connecting a probe to the oscillator circuit (or any electronic circuit) adds extra load to a signal or may distort the waveform displayed on the oscilloscope thanks to the loading effect. Therefore, probing an oscillator circuit requires special care, as the oscillator circuit is highly sensitive to capacitance. There are two main factors to consider in choosing a probe for oscillator testing. The first is that the oscilloscope probe is adding capacitance to the existing load capacitors (C1 and C2 in fig 2). The load capacitance is a parameter for determining the frequency of the oscillation circuit. It is important to note that the change in the value of the load capacitance may result in changes in the output frequency of the oscillator or at worst case, it may stop the oscillation. The second factor is that the probe is introducing resistive loading to the oscillator circuit. Both factors can be significant enough to keep the oscillator from working. At DC or low frequency ranges, probe loading is mostly caused by the resistance of the probe, and as the frequency goes up, capacitive component of the probe becomes the dominant factor in the loading effect. A solution is to use a probe with high input resistance and low input capacitance in order to cause the lowest possible loading effect. In general, a passive probe with 100:1 attenuation ratio such as Keysight N2876A passive probe (with 2.6 pF of input capacitance) reduces capacitive loading significantly on the circuit, compared to a conventional 10:1 passive probe with ~10 pF of capacitive loading. Loading can be further reduced by switching the oscilloscope input coupling from DC to AC, as DC coupling mode on an oscilloscope presents additional loading to the oscillator and may cause it to stop. Or, better yet, using an active probe with low input loading such as Keysight’s N2795A 1 GHz active probe or N2796A 2 GHz single-ended active probe may deliver better results. This active probe provides 1 Mohm input at DC and low frequencies for low resistance in parallel with <1 pF input capacitance loading to the circuits. Another good probe for oscillator circuit measurement is a Keysight InfiniiMax 1130A Series or N2750A Series InfiniiMode probe that presents even lower loading to the circuit. Also, it’s important to note how to connect the probe to the DUT. If your probe connection has obviously longer input lead wires or a connector at the tip, you should suspect frequency response variation and degradation. In general, the longer the input wires or leads of a probe tip, the more it may decrease the bandwidth, increase the loading, cause non-flat frequency response and result in more variation in response. If at all possible, keep the input leads of the probe tip as small as possible, and keep the loop area of connection as small as possible. Figure 4 Keep the input leads and the loop area of the connection as small as possible for more accurate results. Figure 5 If your probe connection has obviously longer input lead wires or a connector at the tip, you should look for frequency response variation and degradation. It’s almost that time again, we’re only a few weeks away from Scope Month 2017! If you missed out last year, or are just getting ready for this year, here’s what you need to know. Just like you, we love oscilloscopes. So Keysight created an entire month to celebrate oscilloscopes and the great engineers who use them, that’s you! March 1, 2017 kicks off Scope Month, which will run through March 31, 2017, and will offer new measurement tips, oscilloscope resources, a new Keysight oscilloscope, and of course oscilloscope giveaways! Everyone’s favorite part of Scope Month is the oscilloscope giveaways, and this year won’t disappoint. For Scope Month 2017, Keysight is giving away more than 125 oscilloscopes! We will be drawing new winners each weekday during Scope Month and posting these drawings on our YouTube Channel along with a helpful measurement tip for you. You will be able to enter the drawing once per day during Scope Month, and all entries will be eligible for the entire drawing period. And the best part is that you can get an extra chance to win: if you enter now, you get an early entry into the sweepstakes (only one per person during the early-entry period). Any questions? Check out the FAQs on this page. Did we miss anything? Ask your questions in the comment section below and we’ll get back to you. Not quite ready to leave a new oscilloscope up to chance? You can also participate in the Test to Impress video contest. Just create and submit a video explaining why you need a new Keysight oscilloscope and how you would use it, and you could win one! Eligible entries will be reviewed by a panel of recognized industry voices who will choose 1 Grand Prize winner to win a 6-GHz 6000 X-Series oscilloscope and 2 “Runner up” winners to receive brand new Keysight 350-MHz 3000T X-Series oscilloscopes. Entries will be accepted March 1-31st, 2017 at www.scopemonth.com. Be sure to stay tuned after Scope Month, because we’ll announce the winners April 14th, 2017. But wait, there’s more… this year the start of Scope Month also means a big SURPRISE. We can’t give it away just yet, but we can tell you there’s a brand new oscilloscope coming to the Keysight family and Scope Month will give you the first chance to see it and even get your hands on one for free (and you’ll definitely want to get your hands on one)! Add the live Scope Month kickoff to your calendar to make sure you’re the first to see it! Oscilloscope Learning Center – Quickly access video tutorials, application notes, white papers, and industry experts. Whether it’s your first time in front of a scope or you’ve been using one for decades, the oscilloscope learning center can help you stay ahead of next technology.